Shawn Moss grew up in the catering business. But like most Virginia-born boys who excelled at sports, he had something bigger in mind for his professional future. An “all-everything” high school offensive lineman, Shawn played in college before hurting his neck. Facing an uncertain future in his early 20s, the kid with dreams of the NFL turned to the only other thing that felt natural to him: Food. Having cooked with his mom, Sue, since he was 12, Shawn eased back into his family comfort zone. Except his competitive nature wouldn’t allow him to coast in the kitchen. Shawn excelled in the culinary arts program at Stratford University in Falls Church and reignited a passion that had been in his blood since day one. In the late ‘90s, Shawn became obsessed with making the best barbecue. He started out reading books and scouring the Internet for tips and recipes. Thanks to a commercial smoker, he began to work experimental rubs for brisket and pork onto the catering menu. He was hitting his stride—and it was time to take things up a notch. Shawn knew he had something special. His devotion to quality—“The meat has to be the best. I will never compromise on that.”—coupled with a knack for experimenting with bold, exciting flavors led to the first location for Shawn’s Smokehouse BBQ in 2013. Shawn opened in Culpeper thanks to the foundation that had been built with early supporters. A second location in Warrenton followed in 2015. In the end, the secret to great barbecue isn’t much of a secret, Shawn said. Get the food right, and the customers will come. Except, as he learned from his mom’s catering business, serving food is also about serving a piece of yourself to others. 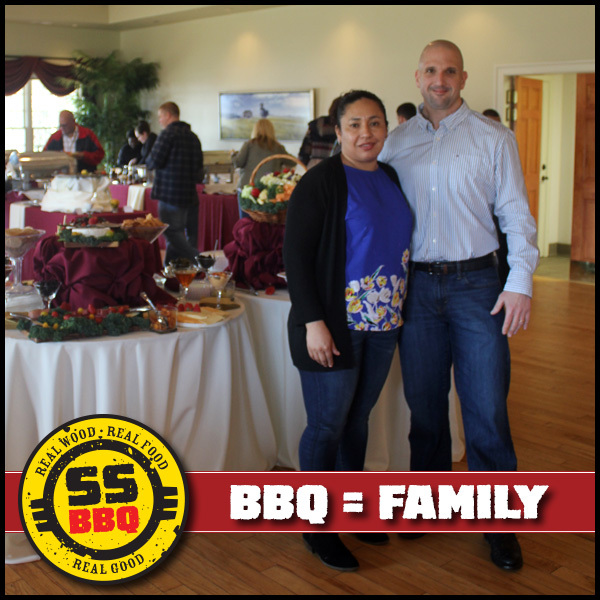 Shawn’s Smokehouse BBQ is a family affair. Wife Magdalena—or “the real Shawn” because of all she does in the kitchen—and his five children all contribute their own flourishes to his barbecue story. Shawn’s name might be on the restaurant, but his entire family is invested in what it means to be the local spot for great barbecue. Being a proud Virginia boy also means it’s important to give back to his home. On Christmas Eve, the Culpeper restaurant hosts a free meal for area homeless individuals, senior citizens and public servants, including police officers and first responders on duty that evening. Shawn also humbly gives his time, along with plenty of food donations, to support his church and kids’ schools. “I love it when I’m at a soccer or baseball game and someone recognizes me as ‘The Barbecue Guy.’ Everybody knows each other in this area, and that’s exactly the kind of place I’m thrilled to call home.